Due to federal antidiscrimination laws, you must know whether laying off an employee violates any legal standards. This knowledge will also protect you in case a disgruntled former employee takes you to court. Follow these steps to learn more. Peruse the EEOC Web site (see Resources below) for information on employment law pertaining to layoffs. Retain a lawyer. Sound legal advice from a competent business law attorney is your best protection against discrimination lawsuits. Find an attorney through the American Bar Association (see Resources below). Institute a probationary period. By law, this period cannot last for more than 6 months. During that time, an employer can legally lay off an employee without severance for any reason. Give proper notice. Except for cases of extreme incompetence or negligence (in which case, a layoff is permitted to occur immediately), you must establish a period of notice prior to the layoff. Search the EEOC Web site (see Resources below) to learn how much notice you must give in each particular layoff situation. Keep records. 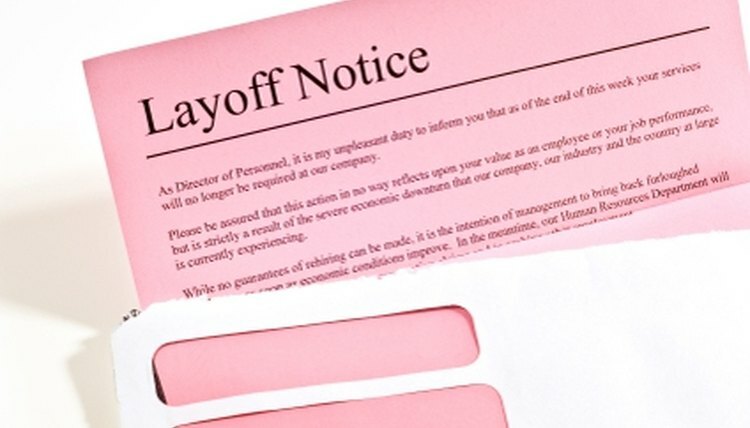 Anytime you lay off an employee, maintain a detailed paper trail regarding the circumstances and actions you took. This will serve as evidence in your defense of any lawsuit. Editor, Legal. "How to Legally Lay Off Employees." , https://legalbeagle.com/2036889-legally-layoff-employees.html. Accessed 19 April 2019.